David Gothard CALLING ALL DRAWGERS!!! 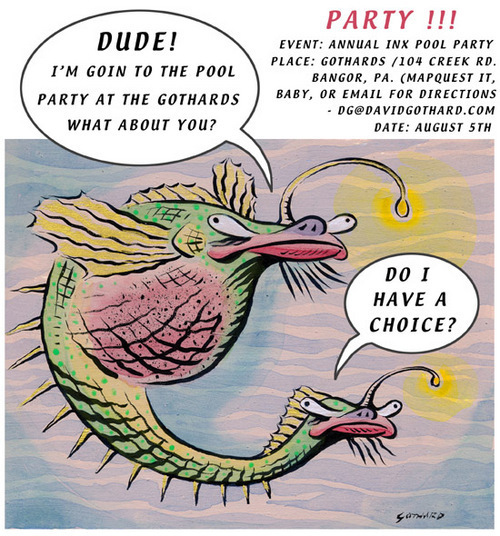 For all you Drawgers within striking distance of the sleepy hamlet of Bangor, Pa. (85 miles from NYC / 65 miles from Philly ) we extend this invitation to come join us at our pool nestled in lush gardens, for a fun filled day of good food (homemade Indian food), good music, spirits, swimming, and great conversation. R.S.V.P for directions by using the contact link here at my Drawger page. Pass along fine and fond regards to big daddio, Randy Jones. Somebody invite that legendary man to Drawer or somethin'! If you give me an address I will send a quart of moonshine and a 40oz PBR chaser can.